Constellation’s new mid-priced Revelation line, on static display only, offers a welcome middle ground between the maker’s entry-point Inspiration and Performance series and combines elements of each: the casework from the former and certain technologies from the latter. I’d seen a late-model Revelation prototype at the Tokyo International Audio Show in the fall of 2016, but much has evolved since then, including nomenclature. Instead of numeric names, as originally planned, the Revelations now have the usual constellatory names. 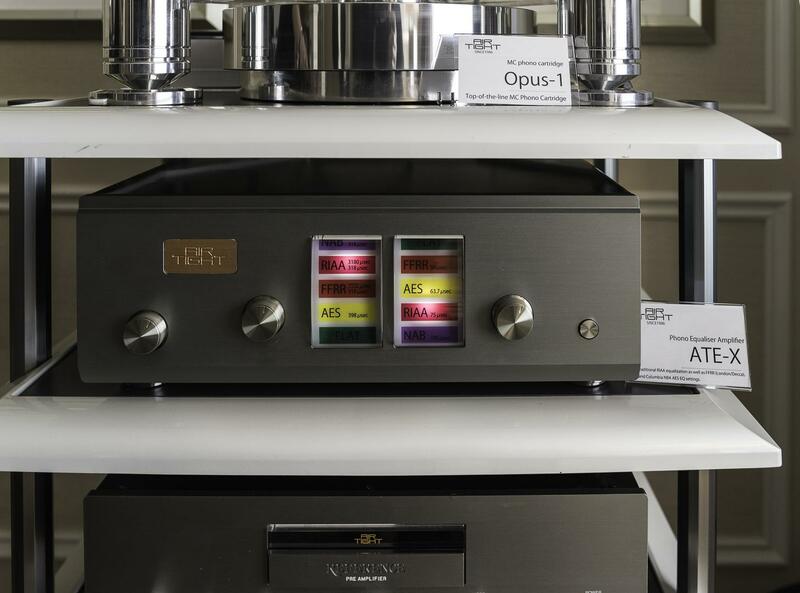 There’s the Taurus stereo amplifier that delivers 250W (also available in monoblocks) for $19.5k each or $39k/pr., the Pictor preamplifier ($18k), and the Andromeda phonostage ($18). Both have separate power supplies and a DC filter option ($5k extra). With 500Wpc into 8 ohms, the Centaur II stereo amplifier ($55k), the latest addition to the Performance lineup, brings a more powerful option and greater micro- and macro-dynamics to that series. 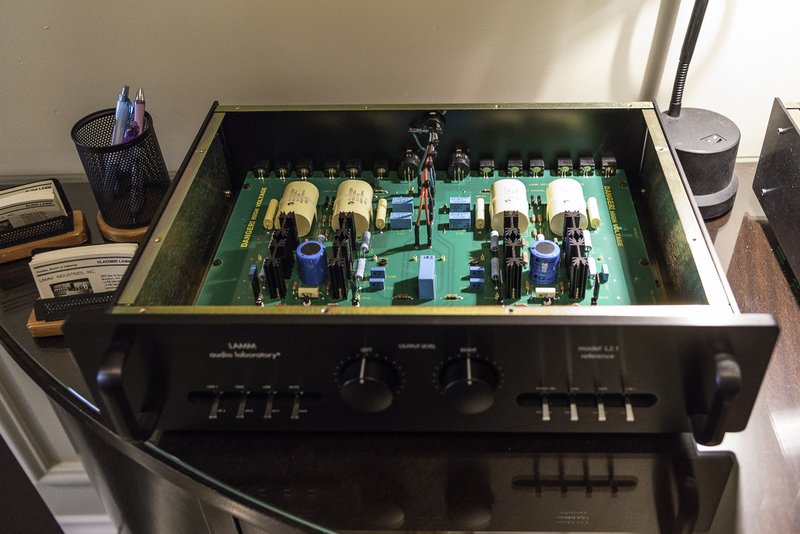 The new amp features elements derived from the Hercules II—one of its massive power transformers and a new capacitor board. The Centaur II really delivered the musical goods on a wide range of tracks, from Holly Cole and Calexico to Leonard Cohen and Liszt piano (alas, digital only) in an outstanding setup where it drove Magico’s new M3 loudspeakers to incredibly realistic, detailed, yet highly musical effect. The MBL N15 monoblock amp ($17,800 each) and N11 preamp ($14,600) debuted at the show—and delivered a big, full, 3-D sonic thrill ride powering the MBL 101E MkII Radialstrahler omnidirectional speakers ($70,500/pr.) via Wireworld Eclipse 7 cables. It was hard to believe these electronics were so fresh off the shelf they’d had no break-in time. According to MBL design engineer Juergen Reis, the N15 can handle more loudspeaker phase shifts thanks to its higher current, and the new N11 design has improved unity gain for better sound quality and greater transparency. All the Noble line amps also feature MBL’s LASA (Linear Analog Switching Amplifier) technology, initiated in the Corona line. While LASA is in essence a Class D variant, the resultant load-independent frequency response and very low (frequency-independent) distortion figures measure more like those of Class A. Hence, these deliver far better sonics than Class D designs of old. The N15 and N11 are expected to be in full production the first half of this year. Audionet of Germany brought forth a pair of late-stage prototype Heisenberg monoblocks ($105k/pr.) alongside a Stern preamp ($45k) and a PAM G2 phonostage ($20,200 with optional EPX power supply) in a sizzling-hot demo driving YG Acoustics Sonja XV speakers ($265,900/pr.). This room also introduced Kubala-Sosna Master Reference cables. Although not the pinnacle of realism, the sound was big and expansive, full and rich, and captured that bold sense of dynamic excitement on an assortment of vinyl played back on a Kronos Pro turntable with Black Beauty tonearm ($48k), from the funky, deep-bass-laden cuts on El Vy’s Return to the Moon to the heavy grooves of The Band’s “King Harvest” on MoFi reissue. Available in either a vertically or horizontally configured form-factor (each with identical overall dimensions), the Heisenberg amp boasts beautiful industrial design conceived by the legendary Hartmut Esslinger, founder of Frogdesign and the creative mind behind the Apple Macintosh computer among other Mac products (and many other high-profile clients). Handmade in Berlin, the Heisenberg features a global patent on its floating panels that allow for ventilation and light. It delivers 530W into 8 ohms and is expected in market in March. On the heels of their highly acclaimed U-300 integrated amplifier, Aavik’s Michael Børressen and Lars Kristensen are back to extend Aavik’s top-tier offerings with the introduction of the C-300 preamp ($36k), P-300 phonostage ($48k), and the forthcoming M-300 mono power amplifier, a 300W version of the U-300 integrated that also features a unique, highly efficient, non-switching Class A output section where the bipolar output devices conduct current continuously. The M-300 is slated to debut at AXPONA and to be available in the U.S. in a couple of months for $48k ($96k/pr.). 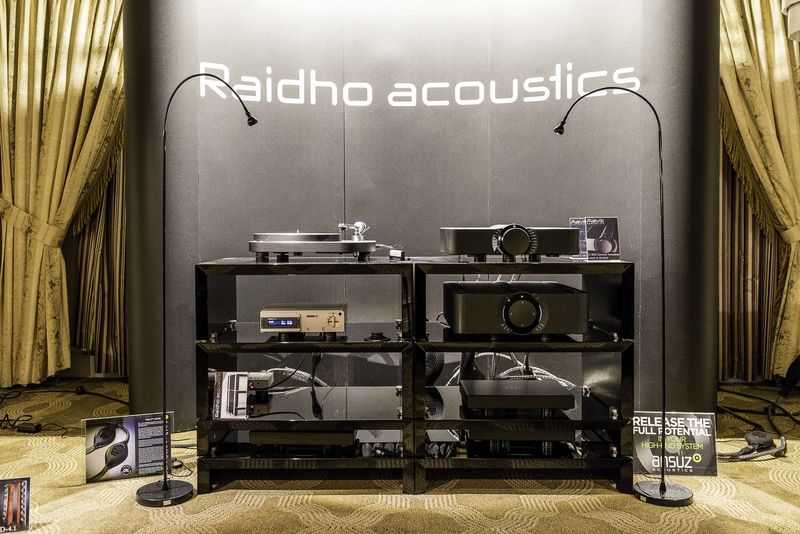 The C-300, which features two built-in DACs (PCM and DSD) and a floating balanced, discrete, bipolar phono section, was demo’d in a stellar-sounding setup with Raidho’s D-4.1 speakers and a NAGRA CD player. Miles Davis’ live version of “Time After Time” sounded simply gorgeous, full of presence, lifelike air, and spaciousness. Vladimir Lamm’s ultra-high-end electronics have paired beautifully with Kharma loudspeakers at prior shows, and this time Lamm Industries debuted a newly updated L2.1 Reference line-level preamp and separate power supply ($22,790 for both chassis) in a chain of Lamm electronics in front of Kharma’s latest flagship Veyron EV2 speakers ($437,500). Cables in this room were from the TchernovCable Ultimate series. The new L2.1 (and L2.1 PS) linestage has been completely redesigned to lower the noise floor, and the power supply now uses larger capacitors. Right and left channel signals are fully separated, including the volume controls, which are costly 40-stepped attenuators made in Japan. Lamm’s Signature tube electronics also delivered fantastic sound in a second room driving Kharma’s Exquisite Midi Grand speakers ($200k) in a demo that got better and better as the show went on. 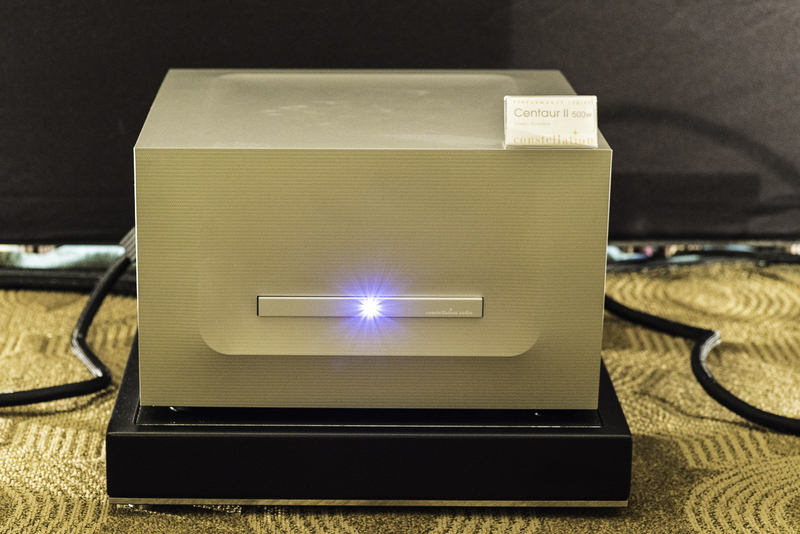 The new lovely-sounding (and lovely-looking) Air Tight ATM-3211 monoblock power amplifier made its U.S. debut at CES. Rated at 100W a side and powered by 211’s in a push-pull configuration, these classic yet modern designs drove Piega Coax 711 three-way speakers to pleasing effect with a good dose of neutrality. Air Tight also introduced its new ATE-X phonostage/phono equalizer amplifier (pictured above), a late-stage prototype of a design we saw during our recent visit to the company’s factory in Osaka, Japan. The phonostage boasts a unique look with multicolored EQ settings that light up with a turn of the dials on the front panel. Moon by Simaudio unveiled a behemoth statement amp, the 888 that delivers—yep, you guessed it—888 watts of power into 8 ohms (and 1776 into 4). First conceived in late 2013, this mighty amp contains Moon’s state-of-the-art technologies in a solid aluminum chassis with a one-inch-thick front panel and massive single-piece cast-aluminum heatsinks that are manufactured using the same process used to make high-performance racing-engine blocks. The circuitry is integrated within the monolithic heatsink to dampen vibration to nearly undetectable limits. Sonics are designed to be fast, effortless, clean, and transparent—emanating from very quiet backgrounds. The price? A clever $118,888. Shipping is expected to begin in May. 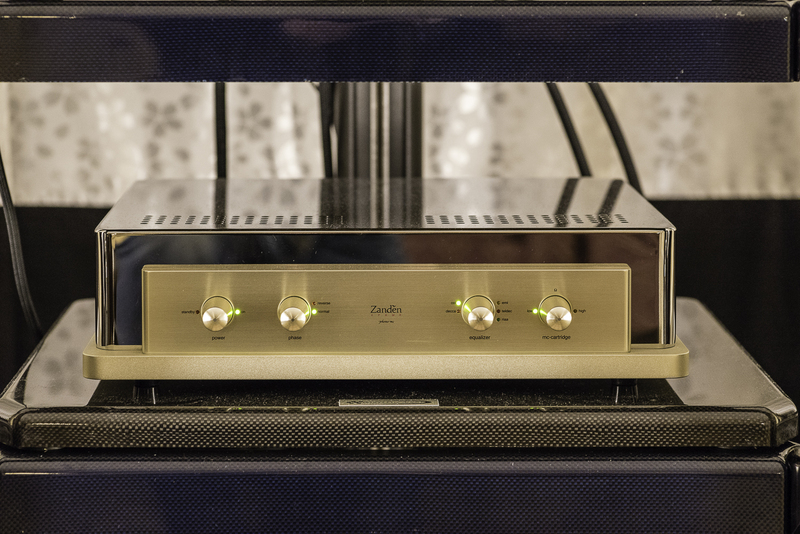 Japanese electronics manufacturer Zanden introduced its new 3000mk2 stereo tube preamplifier ($23k, pictured above) with upgraded power supply and transformer-coupled inputs and outputs. Shipping is slated for end of March. This shiny beauty looks as exquisite as it sounds—ditto the Model 9600mk2 mono amps ($57,200) and 1200mk3 tube phono equalizer ($25k). Paired with Kharma dB-9S speakers ($37.5k) and a Grand Prix Monaco 2.0 turntable ($37.5k) fitted with Air Tight PC-1S cart ($8500), this was an outstanding setup. I wished I’d been able to listen to longer. 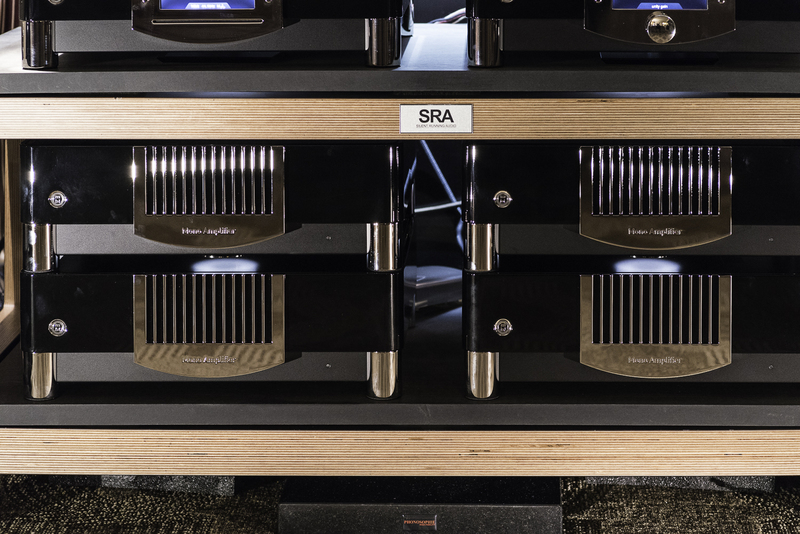 The Soulution 511 stereo amplifier ($30k each; $60k/pr.) made its U.S. debut driving Magico S7 speakers ($58k) in a chain with other exceptional electronics from the Swiss manufacturer. Various racks and supports were supplied by Critical Mass Systems. Bel Canto unveiled its latest integrated amp, the Black ACI 600, a Class D design delivering 300Wpc into 8 ohms and including a programmable phonostage with mm or mc options and programmable line-level analog input for gain matching. Inputs allow for MQA, Roon, and Tidal integration (among other options). The demo paired the Bel Canto integrated with Avantgarde Acoustic’s Zero TA XD semi-active horn system speakers with DSP amplified woofer ($15,600). These were the only horns I heard at the show, and the demo provided some of the most silky-smooth, seamless, and coherent playback around. Yet this system didn’t lack for slam and lightning-quick transient attacks. Great energy, great fun! From the creative minds of Gabi and Edwin Rijnveld of Crystal Cable comes the latest version of The Cube amplifier ($16k, original finish; add around $3k for real gold-plated trim) with new, pure analog circuitry featuring ultra-precision parts made by a company involved in the European space program. This stellar-sounding, stylish, small-footprint amp boasts ultra-low noise courtesy of clever pure analog circuitry design. The Cube drove the company’s petite yet powerful Minissimo speakers (with diamond tweeters) mated to a Subissimo subwoofer to fantastic effect. This combo provides rich, open, and expansive sound that belies the speakers’ size. (Watch for my review of this sub/sat system in an upcoming issue.) Crystal Cable also unveiled its The Ultimate Dream line of ultra-premium monocrystal cables. At the other end of the size and heft spectrum, the D’Agostino room at The Mirage premiered an updated Stromtank battery power source, the S5000HP ($30k), that features a new, high-power version of the original S5000 battery. Weighing in at 276 pounds and built like a tank, the S5000HP now comes with dual sinewave inverters. 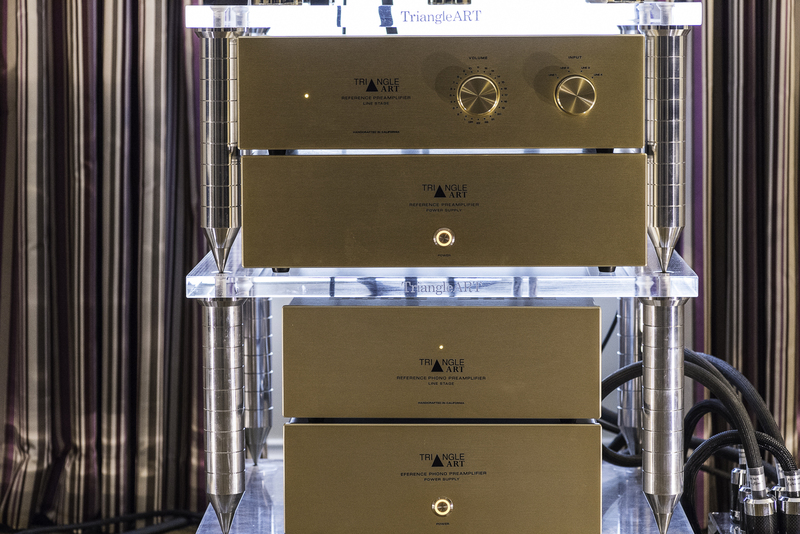 Known for its glitzy high-end turntables, TriangleArt debuted its very first lineup of electronics at the show (pictured above): Reference 160W tube monoblocks ($18k/pr.) featuring KT88s, Reference linestage preamplifier ($18k), and Reference phono preamp ($13k) with mm and mc options. A quick listen revealed slightly warm timbres, plenty of bloom, lively musicality, and good pacey fun on Elvis Presley’s “It’s Now or Never” on LP reissue. Last but not least, VTL unveiled an updated TP6.5 phono preamp that now has a new silver step-up transformer for mc cartridges. This was a noteworthy demo featuring a range of VTL electronics (Reference and Signature lines) in front of a Brinkmann Balance turntable fitted with a Lyra Etna SL cart ($9995) playing back through Wilson Audio Yvette speakers ($25,500). Wires were Nordost Odin 2. Listening to some new LP releases from Deutsche Grammophon, such as a live recording of Sokolov playing Schubert’s piano impromptus, was a thrilling audio delight, so true-to-life seemed his performance. Musical Surroundings of Oakland, CA, unveiled a brand-new version of the DS Audio DS 002 optical cartridge system ($5000)—and what a difference a Mark 2 makes! I’d heard the first iteration chez JV a while back and was not blown away, but this update with a new optical shield and redesigned cart wire suspension for greater channel separation sounded wonderful across a wide range of music; it conveyed detail without getting analytical while remaining quite neutral yet musical. On JV’s Weavers LP, there was an impressive sense of Carnegie Hall acoustics. Vocals were highly resolved, open, and lifelike. Banjo was very realistic too. The new DS 002, which also comes with its own newly upgraded preamp/equalizer (optical phonostage) featuring a new power supply and special transformer shielding for improved SNR, was mounted to the 12-inch AMG 12JT Turbo tonearm, also a CES debut, ($8500) affixed to the AMG V12 ’table driven by a NAGRA Classic integrated amp. This setup was the first one I wanted to stick around and listen to that first day. 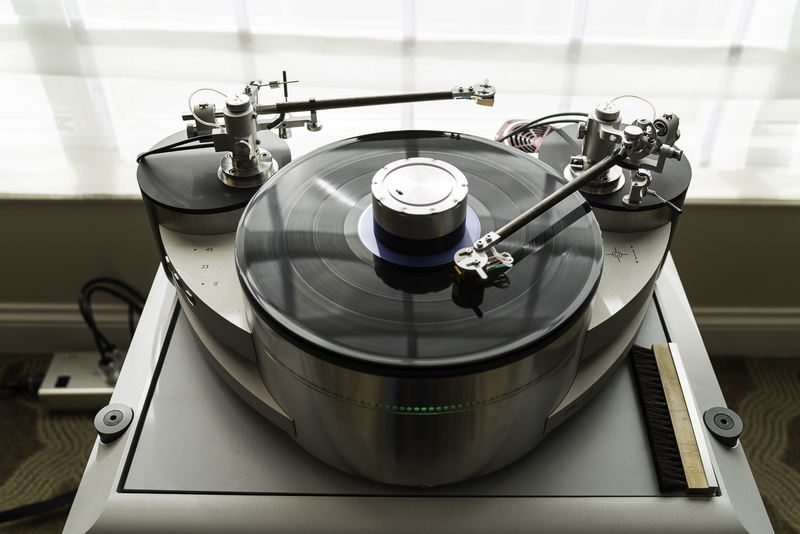 Yes, you read that correctly: Mark Levinson introduced a turntable (pictured above). A collaboration with VPI just conceived within the last 6 to 9 months, the ’table was reportedly played publicly for the very first time at the Hard Rock Hotel in Vegas on the night before the show. It featured a gimbal-bearing tonearm and while the (optional) cartridge pairing is still being finalized, an Ortofon Cadenza was installed for the demo. Preorders are expected to begin in the spring at prices of around $10k without cartridge, and approximately $12k with (cartridge model TBD). Following the fanfare of last year’s release of a very limited-edition SL-1200GAE 50th anniversary ’table (a global production run of just 1200), Technics has returned with a new iteration of that commemorative anniversary ’table: the SL-1200GR ($2k, pictured above). Bill Voss of Panasonic talked me through the SL-1200GR’s backstory, and how certain elements of it were derived from the SL-1200GAE. You might know Technics developed and commercialized the world’s first direct-drive turntable in 1970 and became a pioneering brand ubiquitous within the DJ turntable market (and with consumers too). Fast-forward to Technics’ decision to build upon the heritage of the anniversary edition and bring a slightly lower-priced version to the entry-to-mid-level audiophile market. The SL-1200GR features a new handmade coreless single-rotor direct-drive motor that effectively eliminates cogging (and resultant plinth vibrations) and has more torque than the popular SL-1200 Mk5 iteration, tuned feet made of zinc and silicone, and a high-sensitivity aluminum tonearm with on-the-fly VTA adjustment. An Ortofon cartridge will be an optional add-on. Availability is expected by summer. 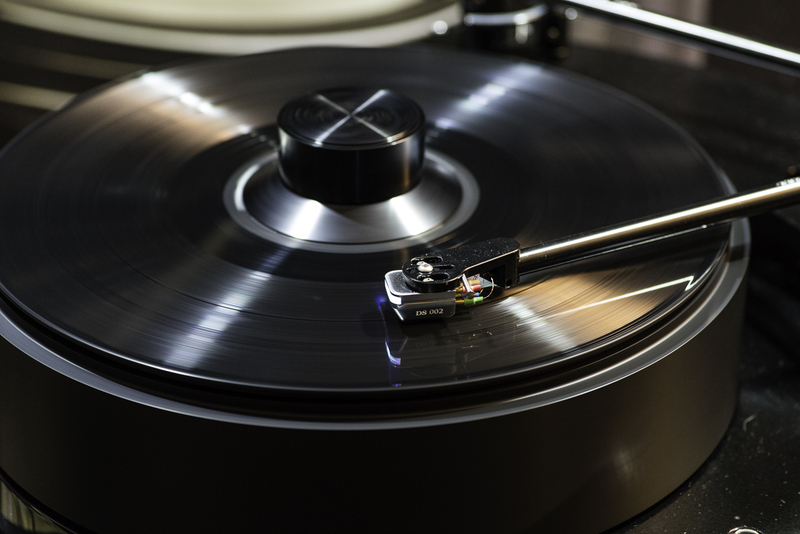 The anxiously awaited (at least by us analog hounds) turntables from Mobile Fidelity are in the final stages of production; therefore, some information is still forthcoming. But here’s what I know thus far. Both models, the StudioDeck and the UltraDeck, were engineered with Allen Perkins on board; the former will start at $999 without cartridge and the latter will be priced at $1799 without cart or at $1999 with a premounted $500 UltraTracker mm cartridge included. A center weight will also be available. Two phono preamps are also forthcoming: The entry-level StudioPhono will retail for $249, and the higher-end UltraPhono will feature a built-in Class A headphone amplifier and sell for $499. Both will offer will offer adjustable gain and mc and mm capability. The new gear will be going into production soon and is expected in market beginning in the next two or three months. Also in the MoFi room in an active demo setup was the superb Spiral Groove Revolution turntable ($24k including tonearm) that I’d heard at the Tokyo International Audio Show; here again it was paired with the bold-sounding TAD Micro Evolution One (aka TAS-ME1-K) stand-mounted speakers that deliver huge sound and hefty bass exceeding their smallish dimensions. Fun stuff. 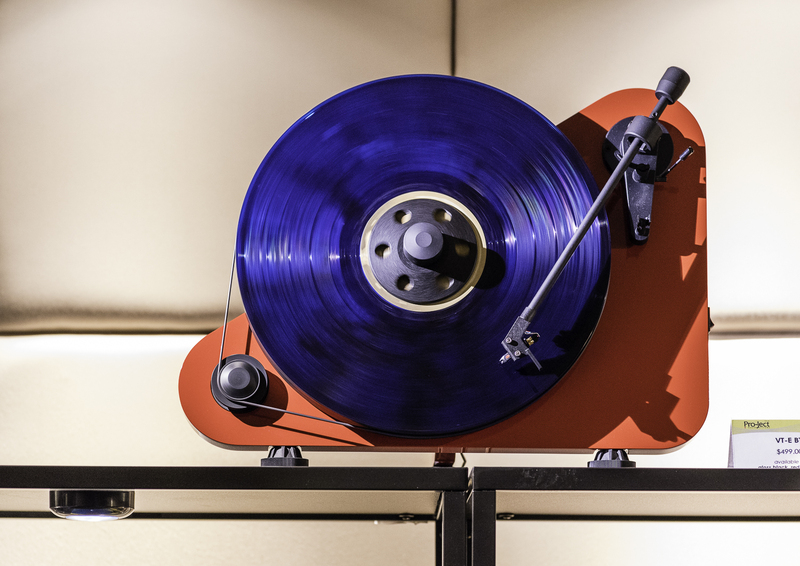 AXISS Audio of Los Angeles premiered an unusual turntable from Reed, a Lithuanian manufacturer: The Muse 3C has a dual motor design and can be run either as a friction drive or a belt drive by making a simple switcheroo under the platter (pictured above). Two tonearms can be mounted and there’s on-the-fly VTA and azimuth adjustment. The Reed Muse 3C was shown with two of the company’s beautiful wood-body tonearms, the 2A two-point ($6k) and the three-point 3P ($8k). 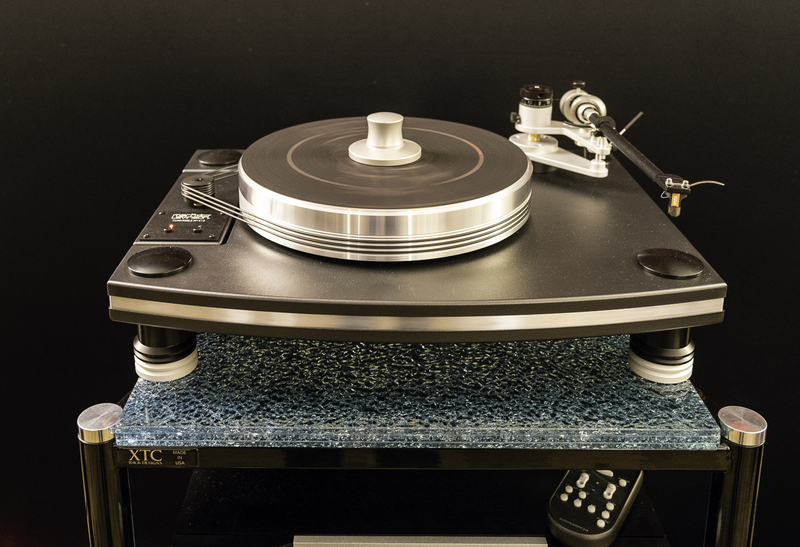 Well-known speaker-maker Elac premiered its new Miracord 90 turntable ($2400), a belt-driven design made in Germany that is the manufacturer’s first new ’table in 35 years! The company recruited an expert designer/engineer out of retirement to develop the product, combining his classic expertise with current-day advancements in technology and materials. The motor unit has double suspension and is fixed within rubber parts on two levels. The bronze bearing axle sits on a ruby ball; the plinth is made of MDF and aluminum and rests on silicone feet for greater damping. Pro-Ject introduced its upgraded VTE BT vertical turntable ($499) that has a built-in phono preamp and Apt X Bluetooth capability. This unique design, a newer version of the vertical ’table that debuted in Munich last May, comes in several color options. Pro-Ject also presented a number of unique special-edition turntables based on the company’s popular Carbon Debut Esprit (and other Debut Carbon) designs. The Beatles have never licensed any products before, but now there’s a Pro-Ject turntable commemorating the band’s breakthrough 1964 tour, with graphics of tickets from that U.S. tour’s venues. Price: $649 (available now). Another Beatles-oriented ’table pays homage to George Harrison with graphics by celebrated street poster artist Shepard Fairey and coincides with the recent release of a Universal/AppleCore LP box set of Harrison’s entire musical output. There’s even a turntable for diehard Wilco fans that celebrates the band’s Wilco Scmilco release (though it’s no longer available). In addition, the company is also now offering phonostages across a range of price-points. Music Hall debuted its MMF 1.3 turntable—a three-speed, belt-driven model with an MDF plinth that comes with an aluminum tonearm, an AudioTechnica AT3600L mm cartridge, a built-in phono preamp, and a dustcover. A very affordable package at just $299, it will be available in May. And you can choose any color so long as it’s black. Also introduced was a brand-new lineup of three affordable cartridges from the English company Goldring that will be in market in the summer. In addition to the aforementioned introduction of TriangleArt electronics, the manufacturer also premiered its Horus tonearm, a single-pivot, ball-bearing design available in either 9-inch or 12-inch lengths and made of attractive and exotic Makassar ebony. YG Acoustics Hailey 2 speakers ($42.8k) powered by NAGRA Classic electronics with a Brinkmann Bardo turntable filled the room with the music’s energizing excitement. Whatever the music called for, this setup delivered it in spades: plenty of slam for the funky, rock on my El Vy LP and nimble, easygoing shifts in dynamics conveyed the fine delicacy of a gorgeous track of acoustic guitar with female vocals recorded live in Paris. Track after track was so compellingly reproduced, I wanted to stick around. MBL 101E MkIIs Radialstrahlers ($70,500/pr.) powered by MBL Noble electronics. It’s no accident these guys regularly host after-hours listening gatherings at shows. These omnidirectionals really immerse listeners within the soundscape like few others. 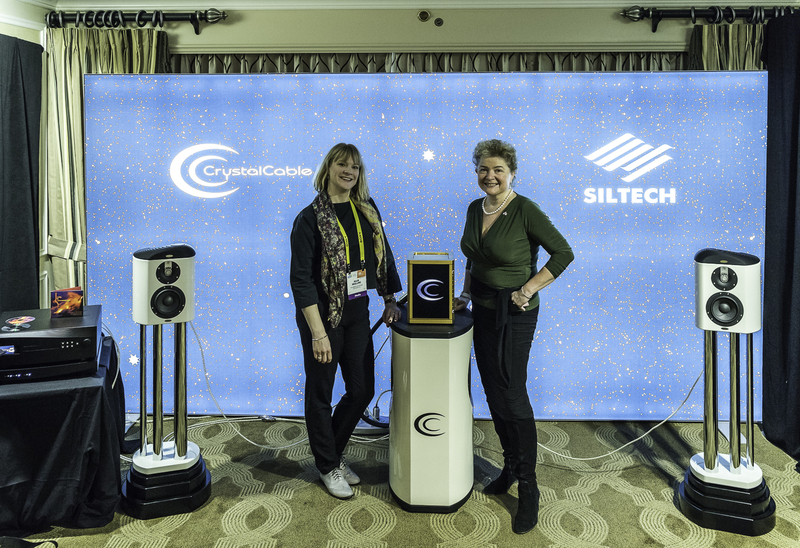 Magico M3 loudspeakers ($75k) driven by a Constellation Centaur II stereo amplifier ($)—sadly a room with a digital-only source on tap, but Shawn Colvin’s sweet rendition of “Viva Las Vegas” had never sounded better. Runner-up: The Aaudio Imports room with the wonderful Wilson Benesch A.C.T. One Evolution P1 loudspeakers ($38,800) driven by Ypsilon Phaethon integrated amplifier ($25k), with a Thales TTT Compact II ’table ($14,500) and Simplicity tonearm ($9200) and Ikeda KAI mc cart ($8500). Elac Adante speakers ($2500) powered by Elac Alchemy DDP-1 preamp ($1995) and DPA-1 stereo amp ($1995) with a DMP-1 digital media player ($1795). GoldenEar Triton Reference speakers ($8500) driven by Pass Labs Xs 150 monoblocks with a PS Audio DirectStream Memory player digital source; Vandersteen Quattro Wood CT ($13,900) paired with Brinkmann sources and electronics (all but one under $10k). New turntable introductions galore! So many options across all price-points, from the basic and austere (MoFi, Music Hall), to updated classics (Technics) and market newcomers (Reed) to the trendy (Pro-Ject’s unique limited-edition designs for Wilco and The Beatles) and the totally tricked-out (TriangleArt). Yes, another three-way tie: Magico M3s, Elac Concentros, MBL 101E MkIIs. And perhaps also the extremely exotic-looking Sonus faber Sf16, the brand’s first “all-in-one” integrated audio system.